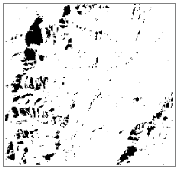 The HillShade tool obtains the hypothetical illumination of a surface by determining illumination values for each cell in a raster. It does this by setting a position for a hypothetical light source and calculating the illumination values of each cell in relation to neighboring cells. It can greatly enhance the visualization of a surface for analysis or graphical display, especially when using transparency. The primary factor when creating a hillshade map for any particular location is the location of the sun in the sky. The azimuth is the angular direction of the sun, measured from north in clockwise degrees from 0 to 360. An azimuth of 90 degrees is east. The default azimuth is 315 degrees (NW). The altitude is the slope or angle of the illumination source above the horizon. The units are in degrees, from 0 (on the horizon) to 90 (overhead). The default is 45 degrees. The hillshade example below has an azimuth of 315 degrees and an altitude of 45 degrees. By placing an elevation raster on top of a hillshade raster and adjusting the transparency by using the Layer Transparency slider on the Appearance tab of the elevation raster, you can easily create a visually appealing relief map of a landscape. You can add other layers, such as land-use types, vegetation, roads, or streams, to further increase the informational content in the display. By modeling shade (the default option), you can calculate the local illumination and whether the cell falls in a shadow or not. By modeling shadow, you can identify each cell that will be in the shadow of another cell at a particular time of day. Cells that are in the shadow of another cell are coded 0; all other cells are coded with integers from 1 to 255. You can reclassify all values greater than 1 to 1, producing a binary output raster. In the example below, the black areas are in shadow. The azimuth is the same in each image, but the sun angle (altitude) has been modified. To calculate the shade value, first the altitude and azimuth of the illumination source are needed. These values will be processed with calculations for slope and aspect to determine the final hillshade value for each cell in the output raster. Note that if the calculation of the hillshade value is < 0, the output cell value will be = 0. The altitude of the illumination source is specified in degrees above horizontal. However, the formula for calculating the hillshade value requires that the angle be represented in radians and be the deflection from the vertical. The direction straight up from the surface (directly overhead) is labeled the Zenith. The zenith angle is measured from the zenith point to the direction of the illumination source and is the 90 degrees complement to the altitude. To calculate the illumination angle, the first step is to convert the altitude angle to the zenith angle. The second step is to convert the angle to radians. The direction of the illumination source, azimuth, is specified in degrees. The hillshade formula requires this angle to be in units of radians. First, the azimuth angle is changed from its geographic unit (compass direction) to a mathematic unit (right angle). Next, the azimuth angle is converted to radians. A moving 3 x 3 window visits each cell in the input raster, and for each cell in the center of the window, an aspect and slope value is calculated using an algorithm that incorporates the values of the cell's eight neighbors. The cells are identified as letters a to i, with e representing the cell for which the aspect is being calculated. As an example, the hillshade value of the center cell of the moving window will be calculated. The cell size is 5 units. The default Altitude of 45 degrees and Azimuth of 315 degrees will be used. 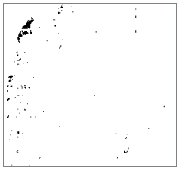 Since the output raster is of integer type, the shade value for center cell e = 154. Burrough, P. A. and McDonell, R. A., 1998. Principles of Geographical Information Systems (Oxford University Press, New York), 190 pp.